I have always been big supporters of Butter Side Up Theatre Company, and of eating quiche, so were disappointed to be double booked for both nights of their latest performance, so instead sent our newest writer (who writes under the name Artisan Friendly) to review the show on our behalf, whilst I ate a quiche in the production’s honour. “Under the direction of Lucy Smith-Jones, performers: Bethan Tanner (Lulie), Annabel Pinchemain (Wren), Maddy Tobin (Dale), Sian Meredith (Vern) and Annie Bolstridge (Ginny) transported us to a lip-smackin’ 1956 when the Susan B. Anthony Society for the Sisters of Gertrude Stein are having their annual quiche breakfast. Will they be able to keep their cool when Communists threaten their idyllic town? What do you think? These ladies know a thing or two about what’s a cookin’ in the oven! On entering the fantastic HOLT performance space, we were transported back to mid-50s middle America by coiffured cuties wearing brightly coloured halter rock and roll dresses, lipstick, powder and paint. They greeted, and issued each of us with a name for the night – Hi y’all, I’m Patricia! With Dream Lover and Lipstick on your Collar playing in the background, I parked myself in a comfortable armchair, took a sip of my cappuccino and soaked up the warm, welcoming atmosphere. The HOLT is perfect for performance. It’s a café but now also a creative space, supporting shows such as the one tonight presented by Butter Side Up. Written by Evan Linder and Andrew Hobgood, Five Lesbians Eating a Quiche was first produced by The New Colony in Chicago in 2011. It was a sensation. Tonight, billed as “A charming one-act satirical comedy about sisterhood, manners, and most of all: Quiche!”, it most certainly scored in each department – quiche has never been so enthralling! With high octane, wonderfully chiming performances between the actresses, the dialogue flew by at a mega charged and rapid pace. Not an easy piece to perform as it is fast moving, quick witted and the interchanges constantly flit from character to character. The performers were completely there for each other, supporting each other and acting as a tight ensemble throughout the show. So much delight was expressed in quiche, it was a joy to behold! With flashes of John Waters: “Eggs! Eggs! EGGS!” and the Women’s Institute high on dairy: “Eggs is toast to the Lord Jesus!”, the twangy exchanges had us rolling around delightfully with mirth. As a siren sounded and an atomic bomb dropped, it was with bliss that the ladies realised they were now trapped together (for at least four years) and could finally reveal that they were lesbians. Not only did they do that, with great gusto, they also got half of the audience to come out as lesbian too! A truly hilarious moment as each cry of ‘I’m a lesbian!’ outdid the previous. 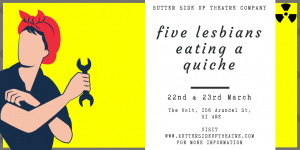 Your last chance to see Five Lesbians Eating a Quiche is Saturday 23 March at The Holt. Tickets are £8.50 plus booking fee and available from www.ticketsource.co.uk/event/294165. Butter Side Up Theatre are also organising their first stand up comedy night Bready Or Not, raising money for LASS (Lesbian Asylum Seekers Sheffield) on Saturday 6 April at The Holt. Tickets are £8 plus booking fee and available from www.ticketsource.co.uk/whats-on/sheffield/the-holt/bready-or-not/2019-04-06/19:30?direct-booking. Butter Side Up Theatre company is an amateur theatre group in Sheffield, specialising in original writing and collaborative works. It was set up as a group for those who wanted to enjoy theatre and performing in a fun and friendly setting. They welcome people of all levels of theatre experience, to get involved with writing, acting, directing, backstage, marketing and multimedia content, in a range of projects. Named after a running joke in Seussical the Musical, Butter Side Up is a fun but committed collection of people who want to create entertaining performances for the city of Sheffield. For further information visit www.buttersideuptheatre.com.